I LOVE lasagna! It is one of our families’ go-to meals. 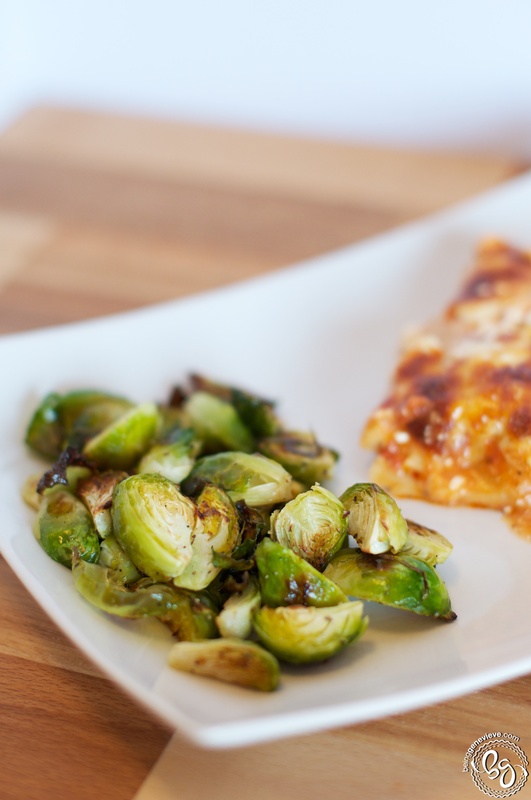 My mom’s recipe is quick, easy and uses ingredients I always have on hand. When we were first married, I mention this to several different friends they all responded that they didn’t make lasagna because it takes too long. I have often thought of this and been confused by their responses. BUT recently I learned that most lasagna recipes require you to cook the noodles ahead of time, before you can put them in the lasagna. What a nightmare! It would make the lasagna process take forever. No wonder so many people buy pre-made lasagna opposed to making it. 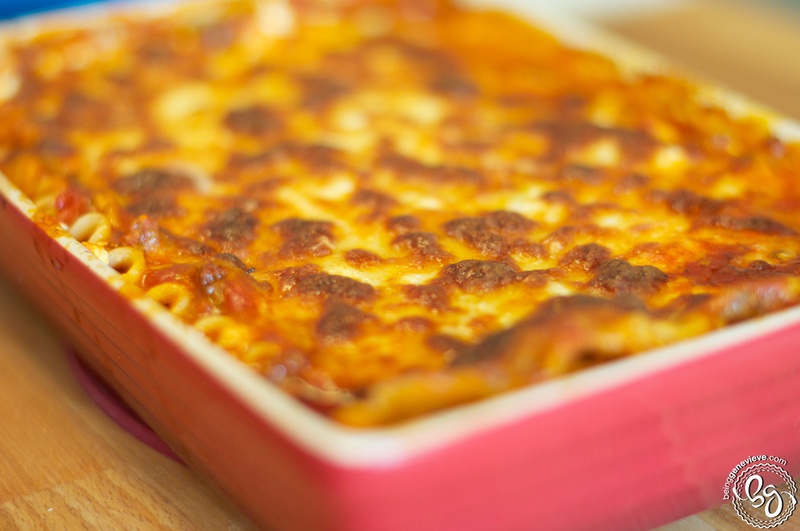 Well I have here my mom’s quick and amazingly easy lasagna recipe that your family will love! I wouldn’t be surprised if this becomes one of your new go-to recipes. Brown ground beef and drain on paper towel. 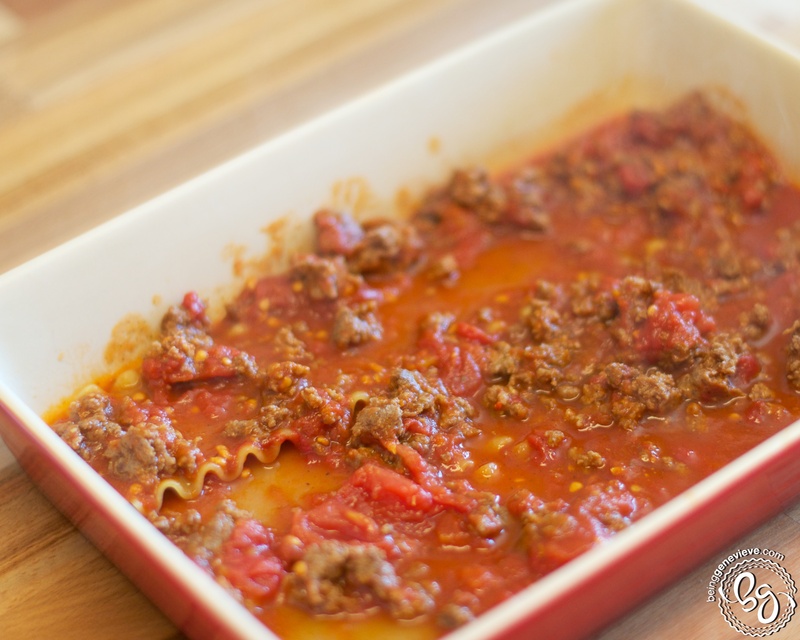 Combine tomatoes, tomato sauce, spaghetti mix and beef back into pan. Bring to a simmer as you gather all the other ingredients. 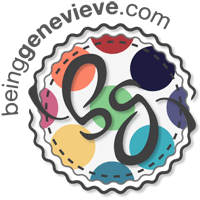 Grease 9″ x 13″ pan and begin layering lasagna. 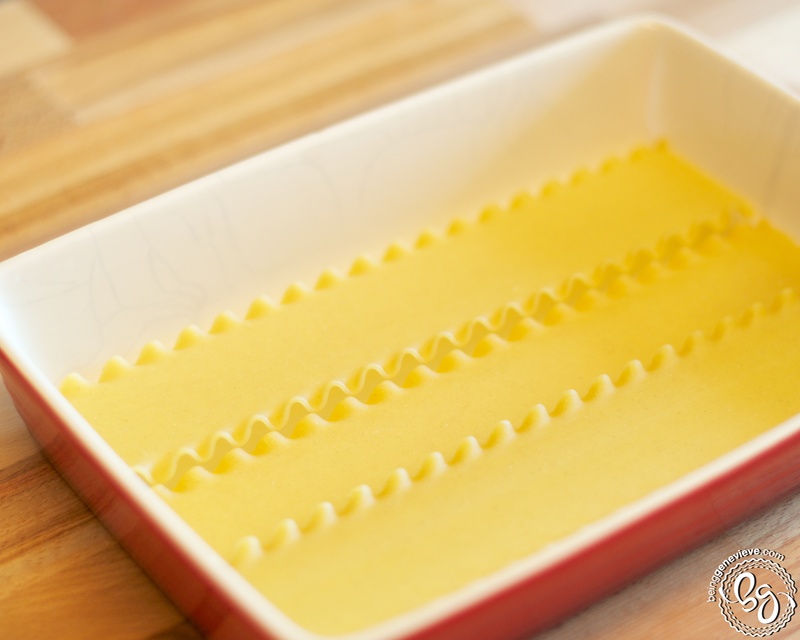 Place uncooked noodles in the bottom of the pan, in a single layer. Pour half of the sauce on to the noodles. Checkerboard the cottage cheese and mozzarella cheese. 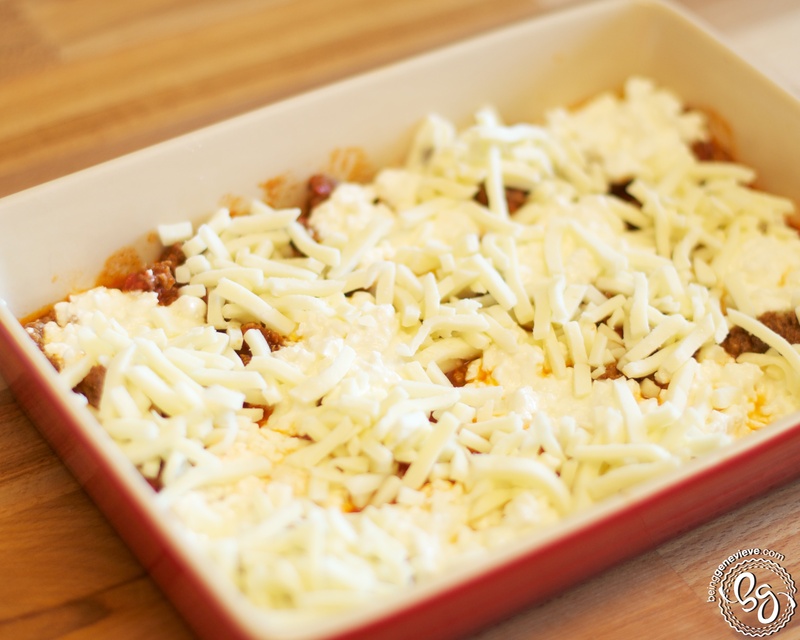 Repeat layering: noodles, the rest of the sauce, checkerboard cheeses. Now sprinkle a little mozzarella cheese onto the cottage cheese areas. 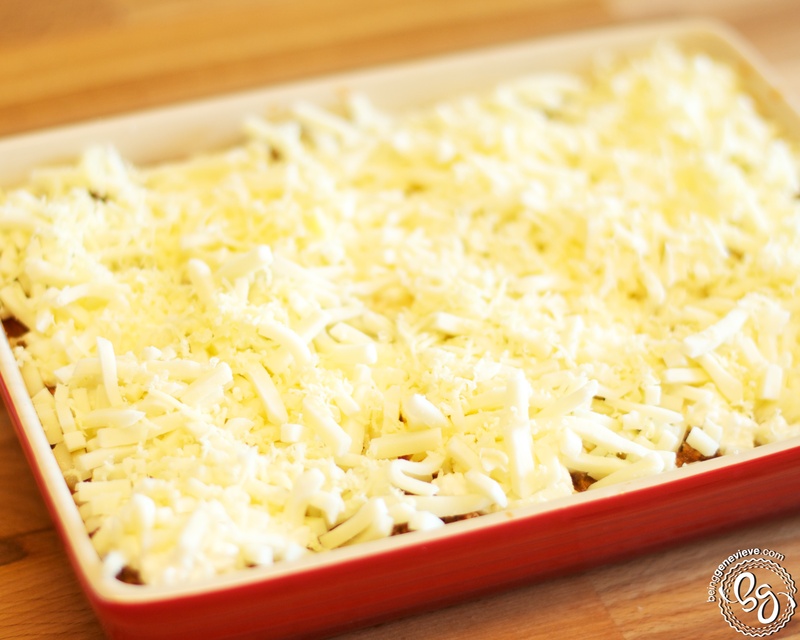 Sprinkle the parmesan cheese over the entire top of the lasagna. Bake for 45 minutes. 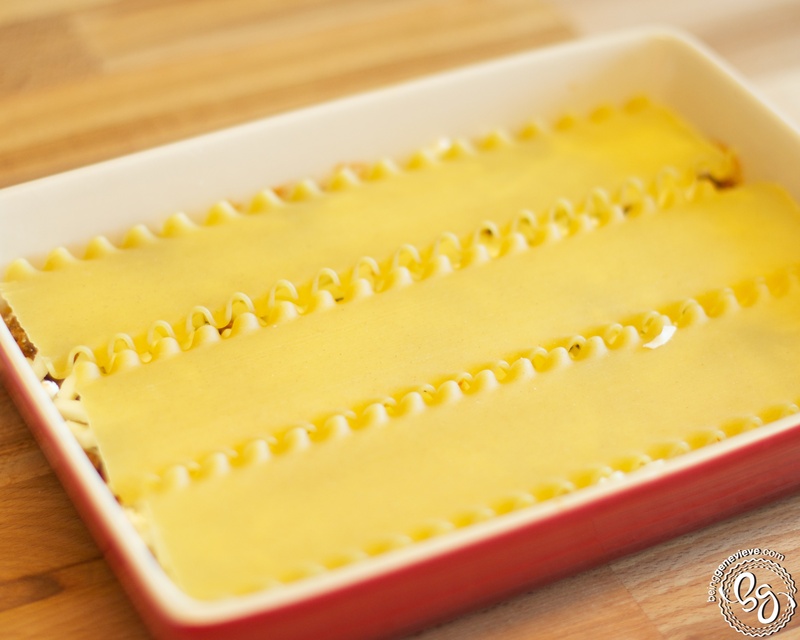 Let cool for 5-10 minutes, before serving, to help the lasagna set up. 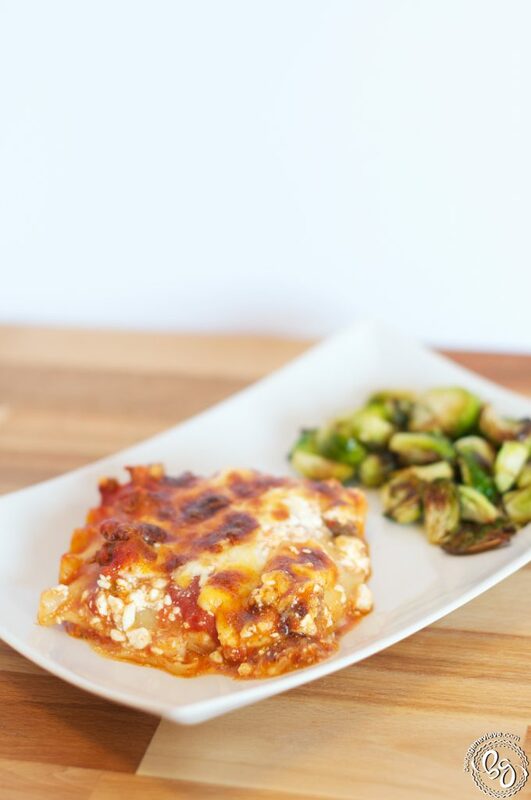 I placed brussel sprouts into the oven while the lasagna cooked so we could pair our lasagna with some delicious roasted brussel sprouts! Brown ground beef and drain on paper towel. Combine tomatoes, tomato sauce, spaghetti mix and beef back into pan. Bring to a simmer as you gather all the other ingredients. 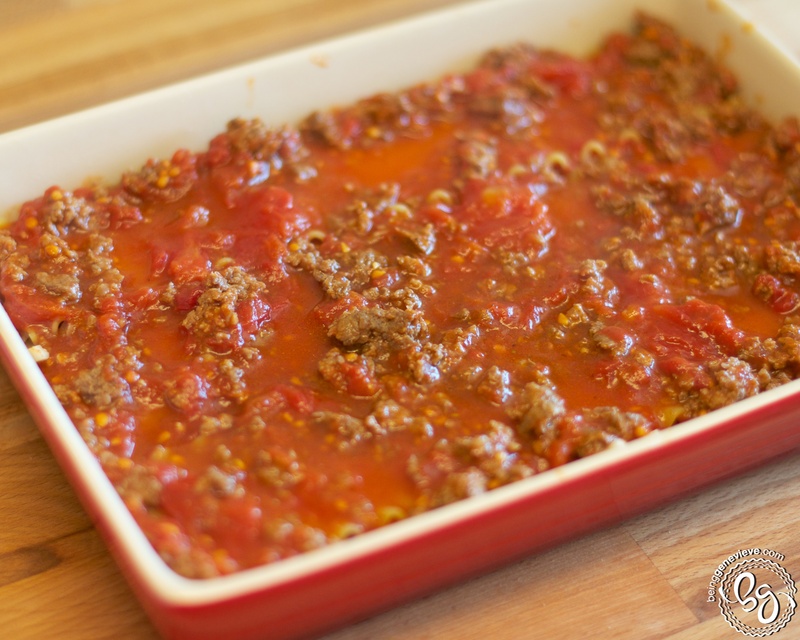 (You could probably even use a bottle of store spaghetti sauce and just mix in the ground beef.) 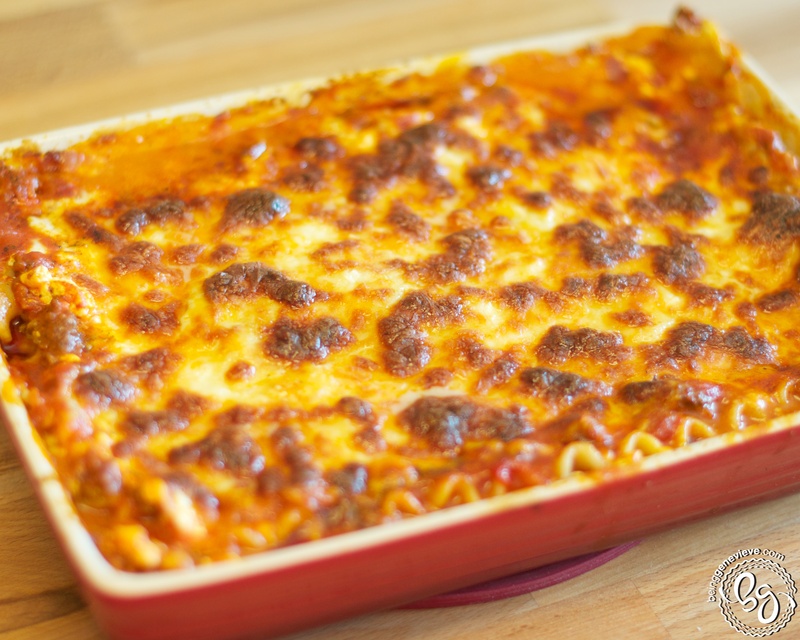 Grease 9″ x 13″ pan and begin layering lasagna; Place uncooked noodles in the bottom of the pan, in a single layer. Pour half of the sauce on to the noodles. Checkerboard the cottage cheese and mozzarella cheese by dropping in with a spoon. 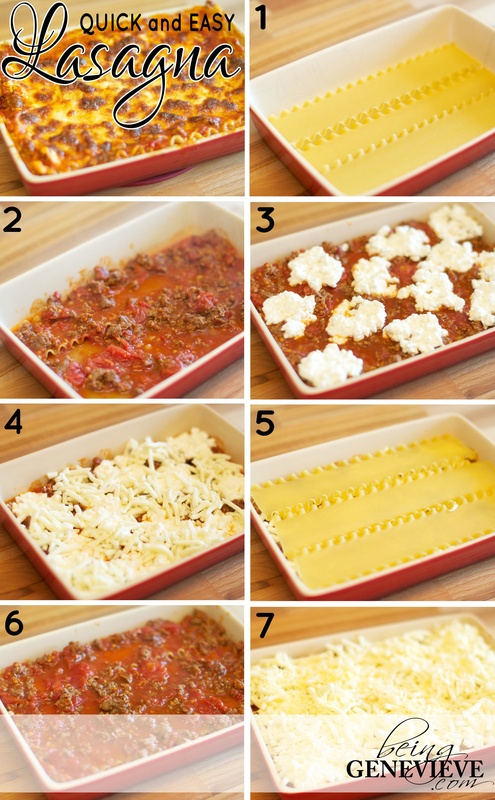 Repeat layering: noodles, the rest of the sauce, checkerboard cheeses. 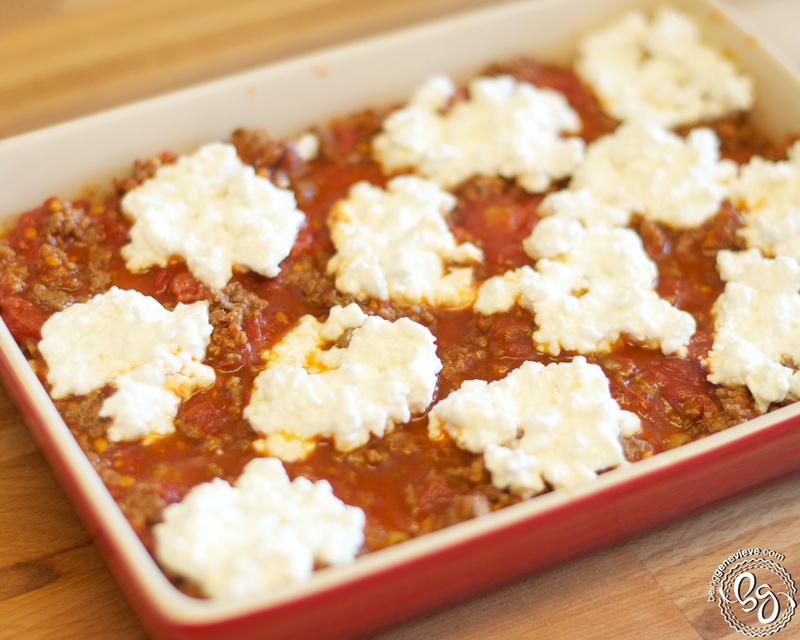 Now sprinkle a little mozzarella cheese onto the cottage cheese areas. 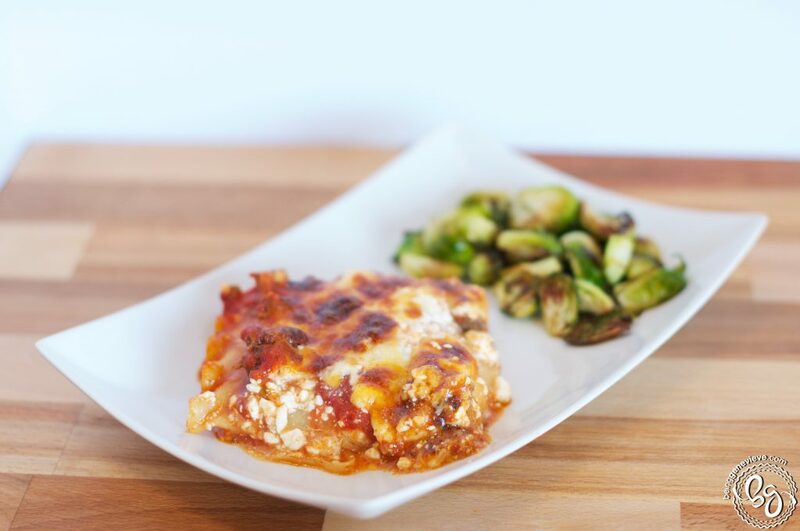 Sprinkle the parmesan cheese over the entire top of the lasagna. 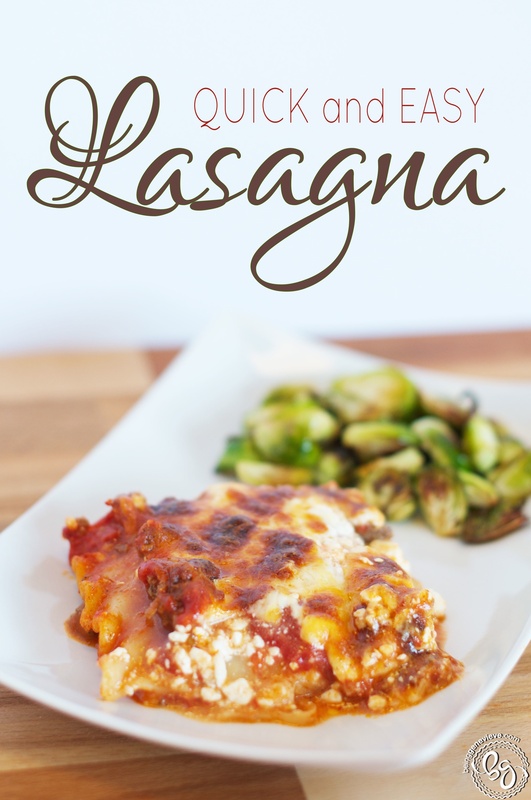 I hope you enjoy this quick and easy lasagna as much as our family! NOTE! In my experience, do NOT buy Walmart brand noodles. They do NOT work and taste awful. And pre-shredded cheese is not my fave either. 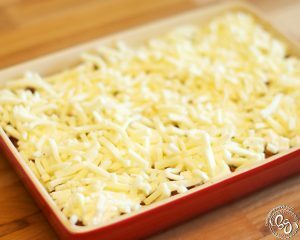 They pre-coat the cheese in cornstarch so it will not stick together – which can give your yummy cheesy lasagna a strange consistency.